Nuuk Art Museum’s collection includes 14 lithographs of mount Sermitsiaq by Anne-Birthe Hove (1951-2012). They are from the year of 2000 and were part of the decoration of the former Hotel Nuuk, owned by Svend Junge. The decoration included additionally three large copper plates called Night Ravens (which are now part of Nuuk Art Museum’s collection too), a large surface of sandblasted glass (which, as far as we know, no longer exists), and ornaments of copper embracing the columns in the entrance hall of the former hotel, then a lobby and bar. While Hotel Nuuk has now been converted into student housing, the copper ornaments are still to be found in there. As a whole, these pieces of art turned into a sort of installation, which segmented and completed the space, endowing it with a particular atmosphere. The mountain Sermitsiaq is an icon, in its presence overlooking Nuuk – from where, conversely, it appears with its own unique shape. This shape is the logo of both Kommuneqarfik Sermersooq and the newspaper Sermitsiaq/AG; it is on postcards and city maps. It is a landmark, which has been pictured again and again and has repeatedly found its way into the arts. Every Sunday at 10 A.M. for a whole year, Anne-Birthe Hove photographed Sermitsiaq from the same spot. 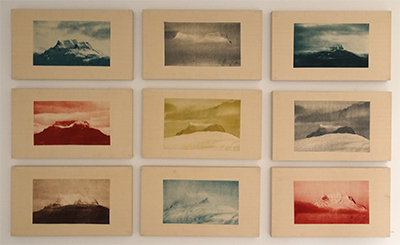 She subsequently printed the mountain in different colours onto cotton canvases, by the graphic technique of photogravure – i.e. a photo is transferred onto a treated copper plate, which after being washed and etched can produce prints using colour inks. Sermitsiaq appears amid clouds or with a clear sky, with snow or without, and in a range of different formations. Some of the photographs are similar but with different colour inks. Together, the colour differences have the effect of a blinking slide show where the motive remains the same – somewhat like at a traffic light shifting colours. A large part of Anne-Birthe Hove’s motives originates from Greenland. In an interview for the art and culture magazine Neriusaaq 3/2005, she affirmed that the cooperation between artist and land goes both ways: “As artists, we are invariably influenced by the country and the landscape that we live in. But we also conquer it. Art consists in conquering the world.” In this series, Hove conquers something physically massive – i.e. the mountain Sermitsiaq – but also something immaterial – the logo, the landmark, and the symbol Sermitsiaq. The artist continued to work with Sermitsiaq during the following years, creating a series of graphic works where buildings, cranes, and the town blend in with the mountain, while photogravure also gets mixed with other graphic techniques. As Lene Therkildsen writes in Neriusaaq 2/2005, the image series can be seen as a paraphrase of Nuuk’s landmark, where Anne-Birthe Hove concurrently challenges and provokes the mountain’s symbolic meaning. In the repetition of the motive and the retelling across many different colours, Sermitsiaq develops into a construction: something that can be altered – and which is all but massive and untouchable. This repetition and paraphrasing of the mountain and symbol Sermitsiaq is at the same time also an illustration of the way Anne-Birthe Hove used to work. She explored, replicated, and immersed herself in different graphic techniques through all of her artistic work. She began working with photogravure in the 1990s; in that same period, her former professor at the Art Academy, Eli Ponsaing, developed new techniques within this particular medium. Occupied as she was by graphic techniques, Ponsaing’s pioneering work inspired Hove to work in a similar direction. Eli Ponsaing thought of his graphic work within a conceptual frame of microcosm and macrocosm — not in a particular religious meaning, but as a process of contemplation of the graphic possibilities and expressions. This tension between the large and the small world is also experienced in Anne-Birthe Hove’s Sermitsiaq series. She zooms in and repeats an element, so to place it into a larger perspective; or she focuses on the detail — the mountain’s physical appearance week after week — to assemble the whole, the mountain’s inner placement and significance. The retrospective exhibition Anne-Birthe Hove 1951-2012 – which is a collaboration between curator Rikke Diemer, Nordatlantisk Brygge, the Art Museum of Bornholm and widower of Anne-Birthe Hove, Thomas Steensgaard – was exhibited at Nuuk Art Museum until July 10th 2016. There, one could experience a larger selection of the Sermitsiaq series. The exhibition was supported by Royal Arctic Line and Tips- og Lottomidlerne. In the fall of 2016, a large anthology about Anne-Birthe Hove was published by Milik Publishing. Catalogues and more information about Anne-Birthe Hove can be found at Nuuk Art Museum.